The Interfaith Forums take place in the Fall and are geared to educate the public, buildfriendships and gain a greater understanding and awareness of the diverse faith traditions represented in Southern Nevada. 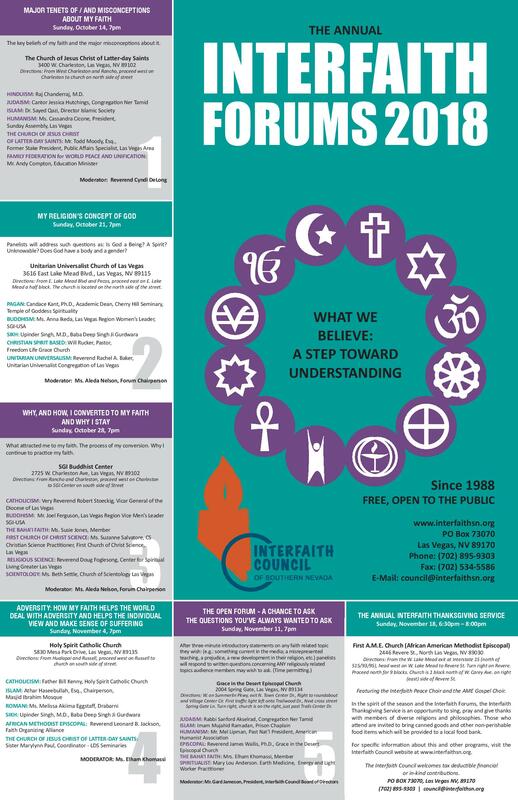 The 2018 Interfaith Forums begin on Sunday, October 14. In a world torn apart by religious misunderstanding, the goal of the Interfaith Forums is to provide an experience where people can hear different religions’ perspectives in an environment of mutual respect. It is a time and place to hear and be heard. In the course of nearly two decades, the forums have helped forge strong relationships between members of Southern Nevada’s diverse religious communities. The annual fall series includes four to five interfaith forums featuring five or six panelists from different world religions, each of whom addresses the same topic from their faith’s scripture or formal public policy. Each forum is a two-hour program held on Sunday evenings. Throughout the series, each forum is held in a different house of worship so that participants can experience the environment, the symbolism and how the physical structure serves the religious community it houses. 1. Ground rules ensure that each speaker can share their religion’s point of view without challenge or debate and that no other religion will attempt to interpret their religion’s scripture. There is no proselytizing or attempt to convert others to a point of view. Agreeing to disagree on matters of difference is central to the program. 2. Following brief presentations from each panelist, audience members address written questions to the moderator who directs the questions to panelists. The moderator selects questions so that each religion receives equal numbers of questions and helps ensure the forum stays on point. 3. The evening ends with refreshments and a brief, informal, social time during which panelists and audience members can become better acquainted. 4. Participants are left to draw their own conclusions. More often than not, the experience is rich, provocative, educational, and inspiring. The forums are followed by a time for socializing and refreshments provided by the host congregation. All forums are open to the public at no cost.